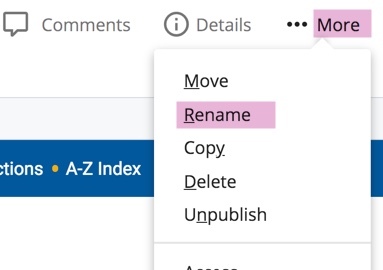 IMPORTANT NOTE: If your page, folder, or file is already published to the server, the system will UN-PUBLISH it before moving, renaming or deleting. You'll need to republish it when you're done. To rename an asset (change the system/page name), click on the asset you'd like to rename and click "...More" and then click "Rename"
In the dialog box that appears, give the asset its new name (remember naming conventions) and then click "Rename"
You'll then get a small message box that lets you know the asset was renamed successfully. 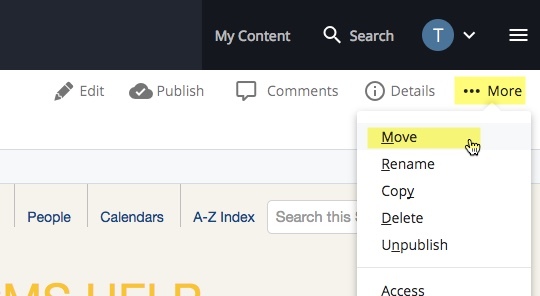 To move an asset, click on the item you'd like to move, click "...More" and then click "Move"
In the dialog box that appears, browse to the new folder (location) and then click "Move". 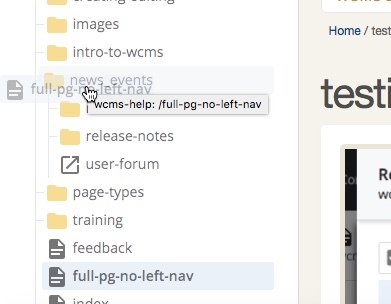 You'll then get a small message box that lets you know the asset was moved successfully.